It looks like Opihi and North Opuha can stay on tomorrow and Te Ngawai can come on at an ‘ECan 50%’. I am trying to get the Restrictions Page updated as it looks to me like the Te Ngawai has come up above 500 l/s which would lift the 50% restriction but we will have to wait and see that come through later this afternoon/evening. South Opuha – you’re currently on restrictions for tomorrow but of course the South Opuha will come up plus 200 – 300 l/s when you stop irrigating. It looks like there is going to be a see-saw/yo-yo situation with your irrigation – on one day off the next. It is a question of whether it is going to stay above 500 l/s through to the afternoon. I can’t tell when you guys started but it looks like some were on around midnight. Can you please ensure you’re off 24 hours after you started, and no later than 9am in the morning. Just to finish off – it has been great to see the lake level flatten off and actually increase over the last week but I thought the graph below puts it into perspective. 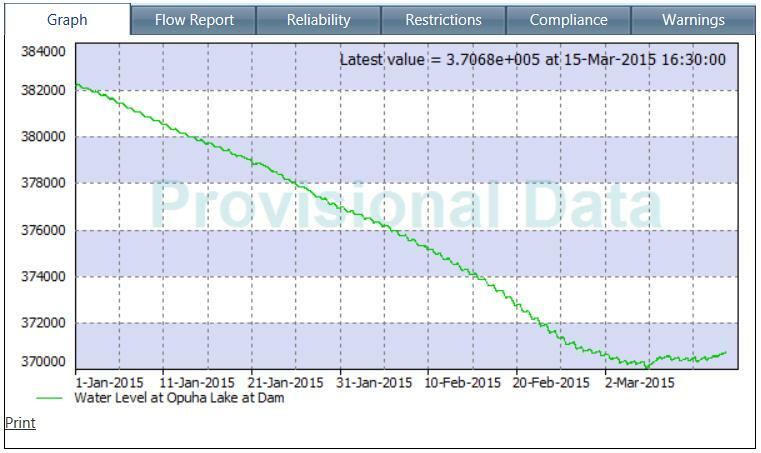 The graphs shows lake level since 1st January. Clearly we have a long way to go yet.